The BAe 125-1000 / Hawker 1000 is a twin-engined long-range corporate travel jet aircraft for max. 15 passengers produced by the British manufacturer BAe, British Aerospace and later by the US-American manufacturer Raytheon, later Hawker Beechcraft. 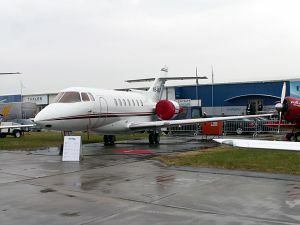 The BAe 125-1000 is a stretched long-range development of the BAe 125-800.